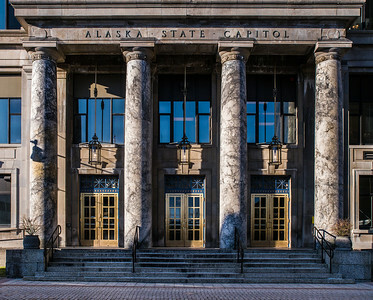 Featuring the architecture, the waterfront, and a few people of Juneau, Alaska. And a few other odds and ends too. 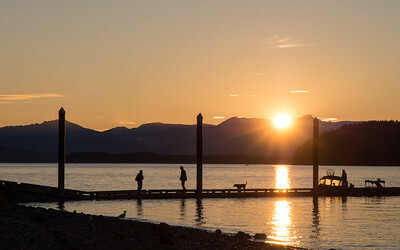 We enjoyed a sunset picnic in North Douglas as people returned from fishing. 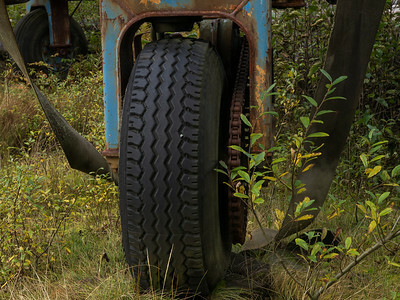 This is down near Di-Pac, a wheel of a crane for lifting shipping containers. 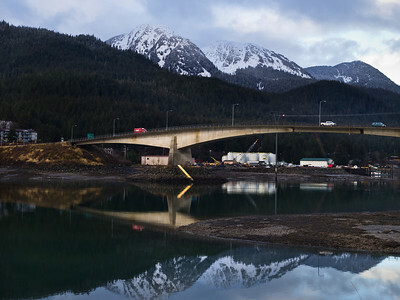 A Coke truck on the morning delivery route crosses the Douglas bridge. February 4th, 2011. 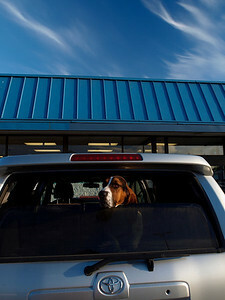 A hound dog of some sort trying to get some all too rare (in Juneau) late July sun. I loved the clouds in this shot, which can also be seen here, taken about an hour earlier. 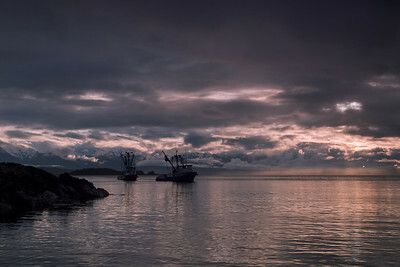 Two fishing boats at wait near Amalga harbor, late in the evening. July 15th, 2010. 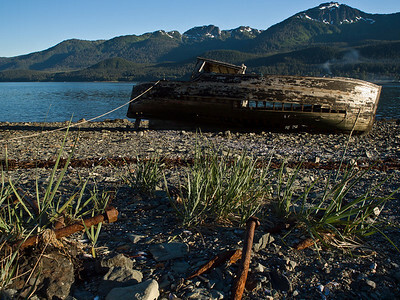 An old boat with old bolts in foreground sits aground just off the road to Thane, South of Juneau. A rope keeps it from becoming a navigational hazard at high tide. July 9th, 2010. How the stuff gets up here, much of it. No barge, no stuff. 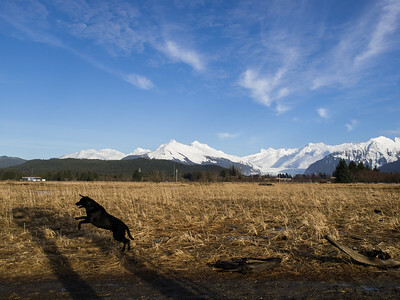 May 28th, near Salmon Creek in Juneau. 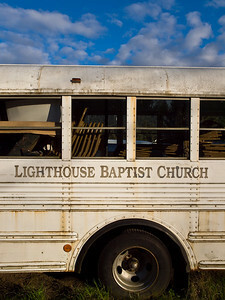 The old church bus is much more photogenic than the new one. May 9, 2009. 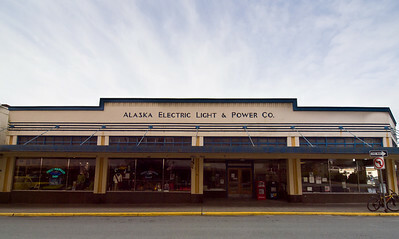 This is now an expensive outdoor equipment store, but AELP still sends out the power bills from another office. May 4th, 2010. 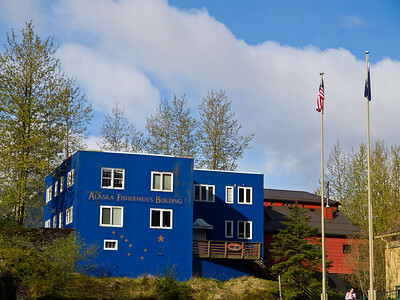 The Alaska Fishermen's Building stands just on the other side of Main street from the capitol. May 3rd, 2010. 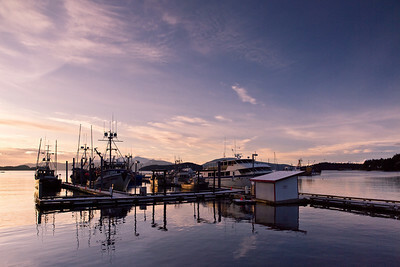 Stattor Harbor at Auke bay looking deceivingly small (it extends a fair ways beyond the boats in front. 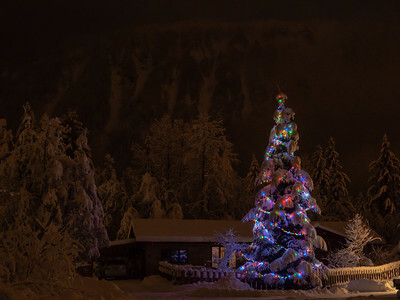 December 14th, 2009. 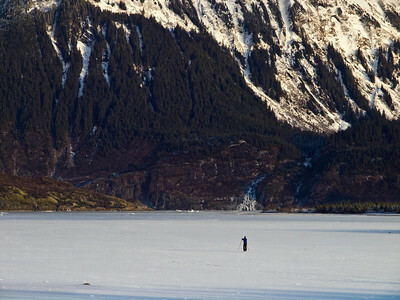 A lone skier on Mendenhall Lake before the heavy snows have come. 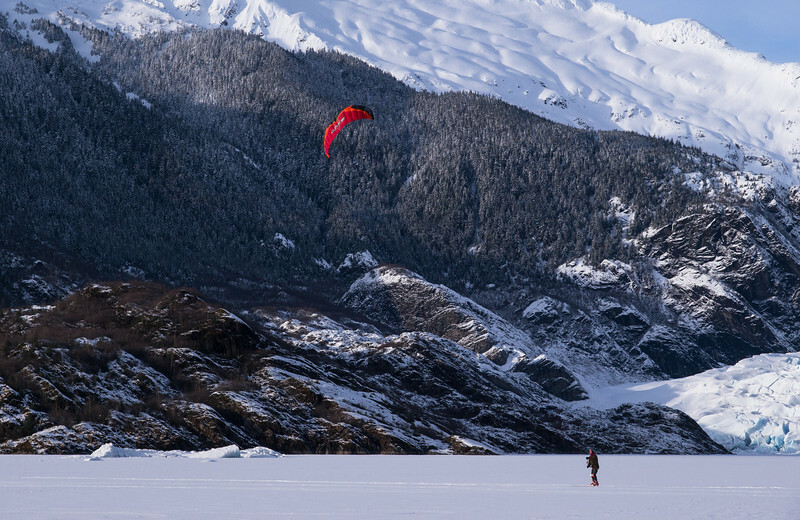 A man and a woman dive into Juneau's waters near where the cruise ships tie up in summer, hoping to find something interesting. They told me the waters are quite full of life, but a little dark and murky sometimes. December 12th, 2009. 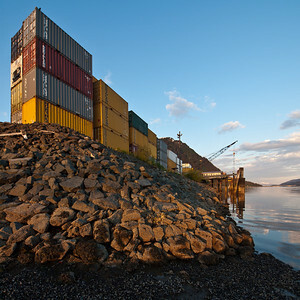 A 16 shot Panorama, two layers of vertical photographs stitched together in Photoshop. This could probably be printed about ten feet across and look fine. 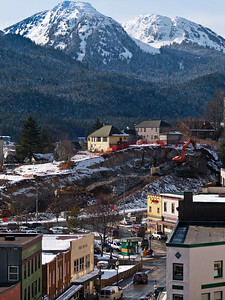 Downtown Juneau as seen from Gold Street. October 20th, 2009. 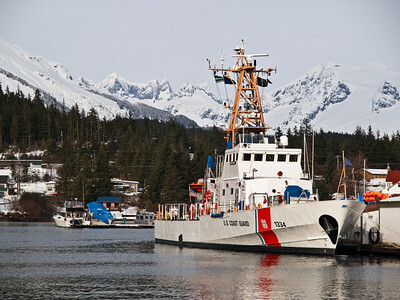 A Coast Guard cutter is stationed at Stattor harbor. The coast guard performs regular rescue operations in the area. The Mendenhall Towers can be seen in the background. March 14th, 2009. Here we can see some of the earlier construction work on the new downtown parking garage, now finished. March 4th, 2009. 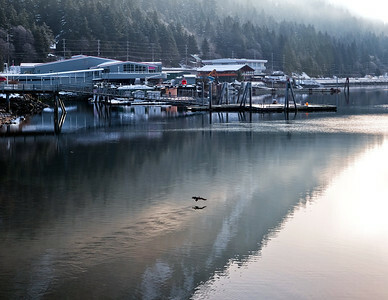 Two ducks take off near the fishing platform next to the hatchery. 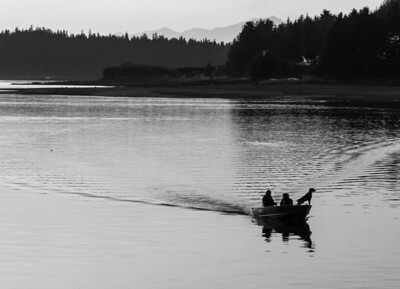 Local residents enjoy fishing off the platform for returning salmon, and local commercial fishermen depend on the returning run. Captured February 19th, 2009. 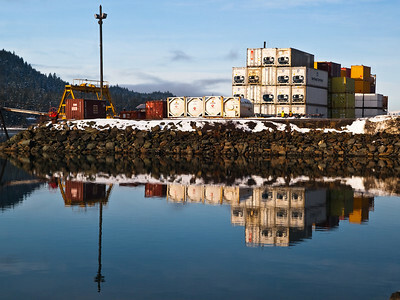 Not far from Salmon Creek a couple miles out of town is one of our container unloading areas, adding a little color to the waterfront in its own way. You can see a couple men taking a break on the right. February 19th, 2009. 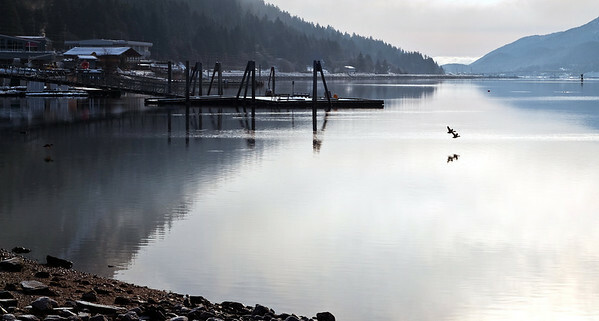 A lone duck takes flight on a foggy morning near the DIPAC hatchery. February 19th, 2009. 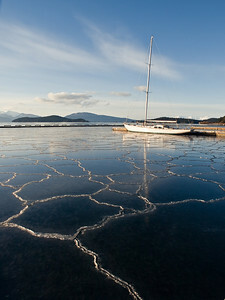 Several nights of below zero temperatures and no snow created this unusual effect at Stattor Harbor in Auke bay. 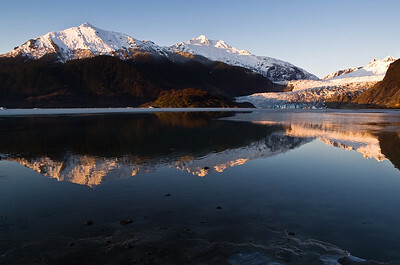 Likely the stillness of the water and perhaps more fresh run-off helped create the ice. January 22, 2009. Winter takes a break. 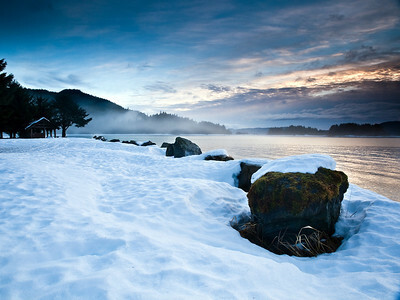 The snow was surprisingly deep along Eagle Beach when this was shot, even after a warm stretch. Captured January 14th, 2009. Some of our winters are worse than others. 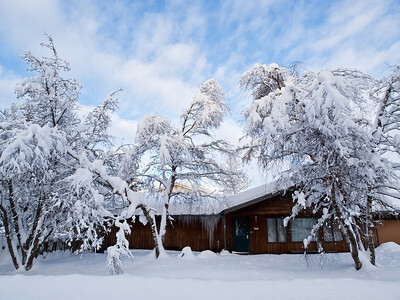 In a bad year the snow can be very heavy, as this house near my own shows. January 6th, 2009. 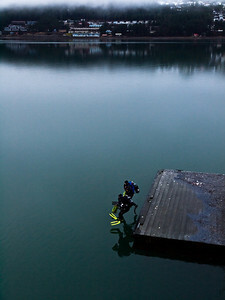 In November the lake can still be mostly unfrozen, if a cold snap hasn't hit. Here is is starting to develop a crust over most of it, and what looks like a large unfrozen portion of the lake is really the outer edge, warmed in the sun. November 16th, 2008. 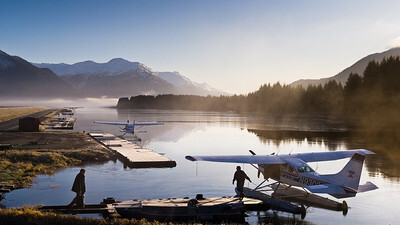 A couple men get ready for a hunting trip at the float plane area of the Juneau International Airport (I could just make out a few words about going hunting). November 16th, 2008. 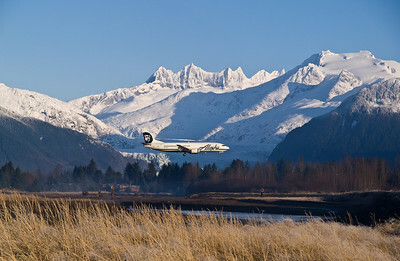 It's quite easy to get a shot of an Alaska Airlines jet in front of the glacier if you are near the river in front of the airport. November 16th, 2009. 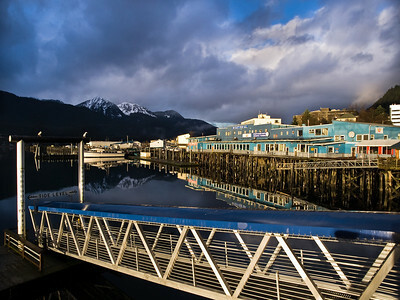 Somewhat dramatic light hits the wharf in downtown Juneau. November 7th, 2008. 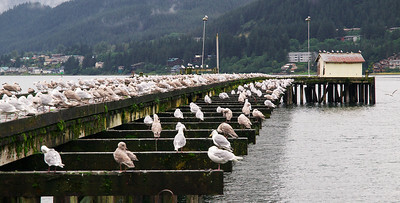 An abandoned pier in downtown Juneau has become a popular seagull resting spot, especially on windy days. September 3rd, 2008. 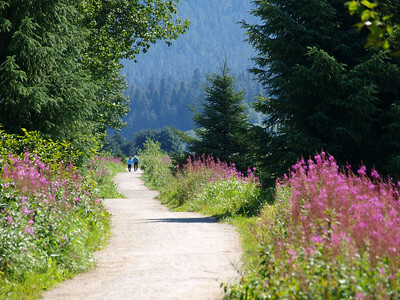 The Airport Dike Trail along the edge of the airport is a popular place for walks year round. August 6th, 2008.